First, let me just say that I have been a monumental procrastinator this week when it comes to updating the blog. I had a deadline looming closer and closer as I prepared for a college class that I will be teaching for the first time and that seemed to consume all of my thoughts. I finally finished the prep yesterday and fired off a copy of my syllabus to the dean for inclusion into the files. So now I can concentrate on this. Early Saturday afternoon, Rich and I went to the fair and spent several hours there talking to spectators and friends. We saw some of his work colleagues and many, many of my former students. I cannot count the number of times I heard my name shrieked across the fairgrounds or the number of hugs I handed out and received. It was so good to see the kids and I told Rich it was probably the last time I will ever be this popular! If any of them read this I want them to know that I expect great things out of them this year because I know they can. By the time we left the fairgrounds on Saturday evening I think even Rich was filled to the brim with fair food and was satisfied until next year. We picked up Leezza and Mango early Sunday morning to bring them home. Since they had been gone, we had released Took and little Asteri into the west pasture to keep Firenze company. That's where we released Leezza and Mango when we got home. They paused briefly at the sight of the tall grass that they had been missing at the fair and then rushed out into the midst of it and began grazing and rolling in it. It didn't take long before they realized that they were back home with their mama and little sister, Asteri. Leezza, Mango and Asteri have the same father; although Leezza has a different mother. So that makes them sisters. Mango was very curious about her little sister, Asteri, who has taken her place with mama Took. They seem to have bonded and I often see Asteri following close behind Mango as she grazes. All of the girls seem to have fallen into their old roles in the pasture. Firenze is still the uncontested queen of the pasture. Took is the patient, serene mama, looking after her little one. Mango is the curious one and Asteri seems to be following her example. Leezza is still the petite little ballerina, dancing through the pasture. One thing I have noticed is that all of the big girls are very protective of the little cria. At sundown, when Asteri ventures out into the pasture for her evening running and pronking session, if mama Took isn't with her, then Leezza or Mango is standing patiently by, watching over her. They all gather around her whenever the dog or strangers are at the fence. The female members of the herd don't completely ignore our Nikko, though. Mango is still often drawn to his side of the fence to graze with him and every morning when we look outside upon waking, all of the girls are sleeping peacefully by the fence with Nikko on the opposite side. Then in the evening at sundown, when Asteri is frolicking, he joins her by running alongside when she is near the border fence of the two pastures. Firenze's belly is growing steadily and within the next three weeks or so we will have another addition to the herd. Rich and I are anxiously awaiting the new arrival. With a goal of leaving the farm at 7:30 this morning, Rich and I strode confidently to the pasture where he had the truck and horse trailer lined up at the gate. We've loaded the animals into the trailer before with no problem and were sure we wouldn't have any problems today. We easily cornered Leezza and Mango and haltered them up and led them to the gate. Mango has been a little difficult lately, kushing during training sessions when she didn't want to walk up the ramp or jump over the low bar. We've learned not to pull on the lead but to lure her with a scoop full of sweet feed. So today we were prepared with a scoop in hand and had every reason to believe that the process would go smoothly. If there's one thing we've learned since the girls came to live with us in October, it's to expect the unexpected and today was no exception. First, both Leezza and Mango refused to walk out of the gate. With a little coaxing and sweet talking, Leezza did walk hesitantly through the gate. I led her in a small circle through the familiar area where her practice course had been set up and then to the rear of the trailer. I would like to report that she hopped right in but that was not the case. She stopped short, her shins touching the rim of the trailer and refused to go any farther. I got into the trailer and tried to persuade her to follow. No such luck. Meanwhile, Rich had lured Mango through the gate and up to the trailer beside Leezza. Mango, following Leezza's lead, also stopped short of jumping in. Both animals turned their heads and looked at each other nose to nose. It was as if Mango was asking, "Are you going to get in there?" Leezza seemed to reply, "No way!" And I'm sure Mango said, "Me neither." So there we were at 7:20 in a deadlock with two stubborn animals. Rich took Leezza and tried circling the area again. Approaching the trailer at a run, he hopped in and again, Leezza stopped short. All the while, I had been trying to lure Mango in with the scoop of sweet feed an inch from her reach. I'd let her have a mouthful and then slowly pull back the scoop, hoping to fool her into the trailer with me. At one point she even had one foot on the edge as if to come on in. But she didn't. After 30 minutes, Rich, who was getting a bit impatient, to put it mildly, asked me to hold both leads. I did. He got out of the trailer and grasping Leezza around her chest behind her front legs, he hoisted her up into the trailer. Before she could react he grabbed her hind quarters and lifted them up and followed her into the cavity of the trailer. Success! We hooked Leezza to an anchor in the side wall. Rich quickly jumped out, grabbed Mango with his arms entirely around her body and before she knew what happened he had lifted her bodily into the trailer, slammed the back door and locked it, and then came to the side door to help me out. At 7:45 we were on our way. We had no problems at the other end of the line and they are now happily ensconced in their pen in the turkey barn. They are the only alpacas to be shown at the fair this year and I would like to think that they are the reigning princesses. The evoked a lot of curiosity from several little children at the fair and both Mango and Leezza are just as curious about all the new sights and sounds around them. We will be going up to the fair several evenings this week but for now, Pressley is in charge and I know she will be taking very good care of our girls. It's been 30 years since I've had to get up at intervals through the night with a baby and let me tell you, as difficult as it is to lose sleep when you're 23 it's waaaaay worse when you're a grandma. At 10:30 p.m. Rich set the alarm for 2:30 a.m. and he went promptly to sleep as usual. Men! I was still so keyed up that I stayed up for another hour. I performed my usual nighttime beauty routine and then tried to settle down. First, the blog. I was dying to share the news with the rest of my circle of friends, so many of whom had requested me to notify them as soon as we had a baby. After that, I was so worried about Took and her new cria that I felt compelled to fire off an e-mail to Amy, our mentor at Amy J's HomesteadAlpacas , to tell her about the birth and to ask her advice. Of course I had my "to do" list of tasks to be performed after the birth of a baby. But Rich and I were more than a little worried that Took hadn't passed the placenta and didn't seem to have any milk yet. When that alarm went off at 2:30 I seriously didn't know where I was for the first few minutes after waking. I stumbled into my clothes, sprayed Off on my ankles and neck; then washed up and made a batch of colostrum to feed the baby. Rich and I headed out into the dark, silent, starry summer night. In the barn we found Took lying close to her baby. Rich held the little one while I pried her lips apart and put the bottle into her mouth. We managed to feed her a couple of ounces as Took looked protectively on, humming her concern. We left Took and the little one sleeping in the barn as the two of us took a minute outside to gaze at the stars in wonder, both of us overcome by the awesomeness of the circle of life. At 7 a.m. when we returned to the barn we found a considerably fluffier baby dozing beside mama Took. We also found a portion of the placenta, which I cleaned up while Rich fed and watered the other animals. Took got an extra portion of sweet feed along side her breakfast. It seemed like she deserved it for presenting us with such a beautiful cria. This time when we woke them up we waited and watched as the little girl tried to find the source of her breakfast. It didn't take her long; but again, she didn't seem to be getting any milk and gave up easily. Rich gently picked up the baby and sat in the old deck chair that he had left in the barn the night before. Tookie watched our every move up close and personal as we fed the little one a few more ounces of colostrum formula. In the early morning quiet of the chilly barn the feeding time was a very moving experience for all four of us. Took was still straining and moaning quietly whenever I touched her so we called the vet who came out around noon. He removed the tissue that she was straining to expel, gave her a couple of shots designed to help her produce milk, and actually milked some colostrum into a cup for us to feed to the baby later if needed. At this point both Took and the little one were exhausted so we left them alone to relax and let nature take its course, so to speak. When we checked back an hour or so later, baby was nursing eagerly at mama Took's side. This was a sight as beautiful to us as any painting of Madonna and child by one of the old masters. Through out the evening last night and all day today Took's pasture mates, Leezza and Firenze, and her elder daughter, Mango, kept tabs on the situation by peering occasionally through the window to check out the situation. Rich and I were discussing the events of the past 24 hours and we both agreed that sharing our home and our life with these gentle, fascinating creatures was a good decision. They have brought a challenging learning experience along with a peace and contentment that we never expected. And today we have a new little star in the herd for we decided to name her Asteri, the Greek word for star. 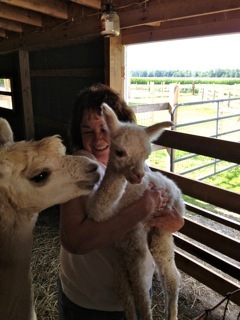 She is the first little star to be born at Buckeye Star Alpaca Farm. This evening at approximately 7pm our Took gave birth to a beautiful, delicate little girl. We haven't weighed her yet because we were surprised and more than a little flustered. We had been gone all day on an excursion on the Cuyahoga Valley Railway with two of Rich's brothers and their wives. We arrived home at a little before 8pm to see the girls huddled together outside their condo. They were transfixed by something on the ground between them. I notice this curious little scene as Rich was pulling into the garage and I ordered him to back up. That's when I saw the little, white cria. He parked and he rushed to the pasture and I hustled Callie into the house, grabbed the camera, threw on a long sleeved shirt (mosquitoes) and ran back out. This is the little girl's first picture. Rich gently lifted the baby and carried her into the barn as mama Took followed closely beside him, humming with concern. The other three girls trailed curiously along behind. The cria was still wet and had a bit of placental tissue hanging around her neck that I removed as soon as Rich put her down in the barn. I rubbed her vigorously with a clean towel and left her to her mother. The little sweetie pie tried several times to nurse and seemed to have difficulty finding the right spot. When she finally found a teat she latched on and sucked away but none of her efforts lasted long and they seemed to exhaust her. The cria settled down in the hay and Took hovered nearby. Rich and I went inside to leave them to their own devices, hoping that natural instincts would take over. When we checked her an hour later she hadn't moved from the spot and seemed really tired so we mixed up a bottle of colostrum formula and Rich held her as I fed her. She was ravenous and obviously hadn't gotten anything from Took. After eating her fill she wandered around the barn checking out every corner, Took following closely behind. She settled down in the straw and seemed tired after her efforts so Rich and I turned out the lights and came back into the house. We will be checking on them every few hours overnight to make sure that the little one is eating enough and hopefully, Took will take over and feed her. More tomorrow.